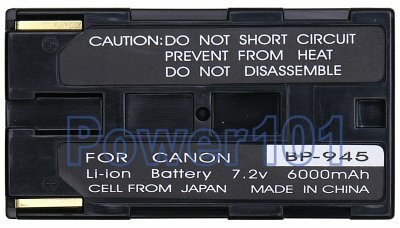 Please use our canon camcorder battery finder to check which battery you need. 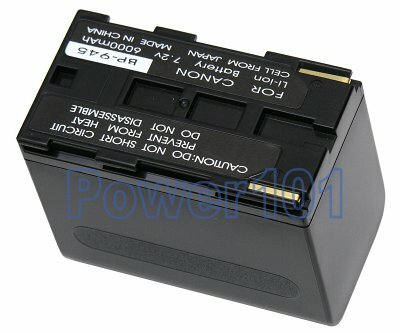 This battery fits many Canon camcorders such as XL1, XL1S, GL1, GL2, XL2, XM1, XM2, E1, E2, and many others. Please check your camera/camcorder with our battery finder. When it comes to pro filming, this 8-hour battery has no equivalent. It can supply enough juice for your camcorder and light to capture the best moments with the best of technology. Moreover, these batteries can be stacked together to virtually give any runtime needed. What is the difference between BP-941 and BP-945? Originally, Canon batteries came with different capacity ratings. BP-941 was smaller capacity than BP-945, even though they looked the same. It was a marketing trick to get more money from the consumer. These BP-945 have higher capacity than either of the Canon batteries and at just fraction of the cost. We recommend the mid-size battery as it should be rated for about 4 hours of filming which is usually what average events go for. The mid-size battery does not stick out too much from the camcorder so it still looks fine. The largest battery usually sticks out too much. In this case, the mid-size battery is BP-930, please check it out. This battery can be charged with any charger designed for BP-915, BP-930, BP-941 or BP-945. It can also be charged directly on your camcorder. and $7.99 shipping & handling for each additional battery!